Scott Alexander on multipolar outcomes in Bostrom’s Superintelligence. Adventures in cognitive biases (calibration training, etc.). Müller & Bostrom, Future progress in artificial intelligence: a poll among experts. Ord, The timing of labour aimed at reducing existential risk. In the USA, avionics software must be certified by designated specialists beholden to (e.g.) the FAA. But when it comes to software for self-driving cars, Google is pushing hard for a system of self-certification. So apparently there was a hit TV show in the late 90s, with more viewers than Game of Thrones, about a naked guy in a small room who had to survive entirely on sweepstakes winnings (e.g. dog food) for more than a year and who didn’t know he was on TV the whole time. Obviously, this happened in Japan. GiveWell, The moral value of the far future. Sandberg on gain-of-function research on flu viruses. Slate Star Codex, How common are science failures? The NSA revelations all in one chart. New ranking of top philosophy journals (Leiter + Google Scholar + citable documents). I read Thiel’s Zero to One (2014) in May, but forgot to mention it in the May books post. I enjoyed it very much. His key argument is that progress comes from monopolies, not from strong competition, so we should encourage certain kinds of monopolies. I generally agree. I also agree with Thiel that technological progress has slowed since the 70s, with the (lone?) exception of IT. The Info Mesa (2003), by Ed Regis, is fine but less interesting than Great Mambo Chicken (which I’m currently reading) and Nano (which I finished last month). The Atomic Bazaar (2003), by William Langewiesche, tells the story of nuclear trafficking and the rise of poor countries with nuclear weapons programs, and especially the activities of Abdul Qadeer Khan. It was pretty good, though I wish it had done a better job of explaining the limits, opportunities, and incentives at play in the nuclear arms trade. Age of Ambition (2014), by Evan Osnos, is a fantastically rich portrait of modern China. Highly recommended. Human Accomplishment (2003), by Charles Murray, is a fine specimen of quantitative historical analysis. The final chapters are less persuasive than the rest of the book, but despite this terms like magisterial and tour de force come to mind. Murray does an excellent job walking the reader through his methodology, its pros and cons, the reasons for it, and the conclusions that can and can’t be drawn from it. You’ll probably like this if you enjoyed Pinker’s Better Angels of Our Nature. Superintelligence (2014), by Nick Bostrom, is a fantastic summary of the last ~15 years of strategic thinking about machine superintelligence from (largely) FHI and MIRI, the two institutes focused most directly on the issue. If you want to get a sense of what’s been learned during that time, first read Bostrom’s 1997 paper on superintelligence (and other topics), and then read his new book. It comes out in the UK on July 3rd and in the USA on September 3rd. Highly recommended. The Honest Truth about Dishonesty (2013), by Dan Ariely, is as fun and practical as the other Ariely books. Recommended. Interviews with Allan Friedman and Roger Schell. GiveWell, Potential global catastrophic risk focus areas. Superintelligence tops FT‘s summer reading list for science books. BBC: What our descendants will deplore about us. Beckstead, Will we eventually be able to colonize other stars? GiveWell conversation with Tom Dietterich about long-term AI safety. Two professional soccer players vs. 55 children (video). Sean Carroll: Physicists should stop saying silly things about philosophy. Reminder: Quantum computers still aren’t faster than regular old computers. In Science: the existence of the American continents may have been deduced by a Medieval scholar from Central Asia. Ben Kuhn: A guide to giving away money. Interview with Gwern Branwen on intelligence amplification. Steven Hawking on Last Week Tonight talking about intelligence explosion and other topics (very funny). Huh. So it turns out that Elon Musk is pretty concerned about AGI risk. Why Netflix never implemented the algorithm that won the Netflix $1 Million Challenge. A small study of which presentations of EA are most effective. How Google converted language translation into a problem of vector space mathematics. Philosopher Peter Unger has less respect for philosophy than I do. Karnofsky, Sequence Thinking vs. Cluster Thinking and Modeling Extreme Model Uncertainty and a worked example. Robin Hanson argues for variable vigilance, Scott Alexander argues for constant vigilance. Pinker, Writing in the 21st Century. Timelapse video of a stellar explosion, recorded by Hubble over 4 years. A computer program has passed (an easy version of) the Turing test. It doesn’t mean much. My favorite net neutrality rant yet (John Oliver). Dominic Cummings, policy advisor to the UK education secretary, releases a somewhat amazing 237-page document on education priorities. MacKenzie, “Computer-related accidental death: an empirical exploration” (1994). Seán Ó hÉigeartaigh (FHI & CSER) gave a 13-minute introduction to existential risk. The World Economic Forum’s Global Risks 2014 report provides a snapshot of what a certain set of thought leaders think is worth worrying about. Another snapshot comes from the responses to Edge.org’s 2013 annual question. The Onion: World’s Supercomputers Release Study Confirming They Are Not Powerful Enough. Frustrated scholar creates new way to fund, publish and peer-review academic work. Dogecoin accepted. James Hamblin in The Atlantic: But what would the end of humanity mean for me? Nick Beckstead’s suggestions for effective altruism research topics. Schwitzgebel, A Theory of Jerks. A Type House Divided: inside the split of the Hoefler/Frere-Jones typography team. MIRI wants to fund your independently-organized Friendly AI workshop. New DoD report on their plans for autonomous robots, 2013-2038. Watch a computer try to learn how to walk (video). What a Symposium on Theory of Computing (STOC) might have been like in Medieval times. Eliezer Yudkowsky takes another shot (Nov. 2013) at explaining what he was trying to get across in his metaethics sequence. The ontological argument for God’s existence, formalized and proved with PVS. Ants acting as both a solid and a liquid (video). 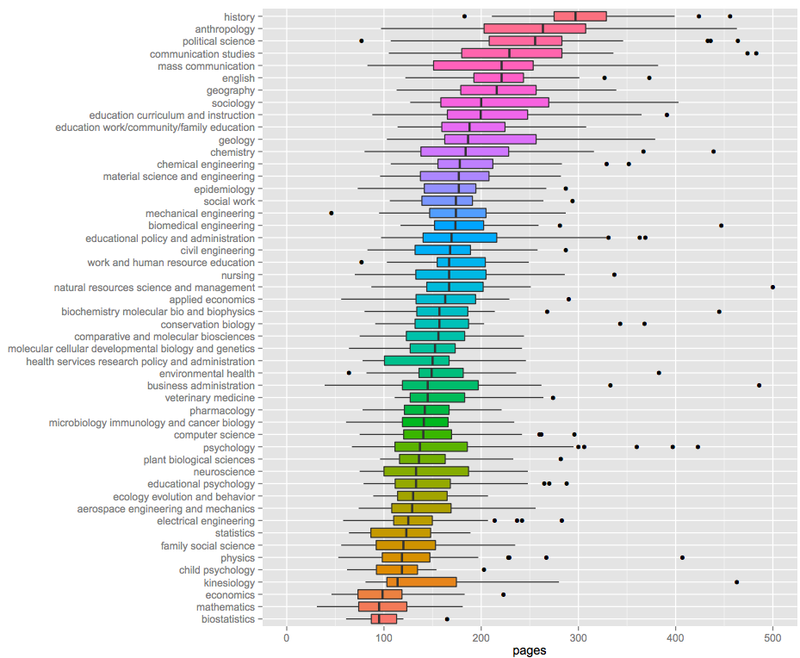 Average length of PhD dissertations by major. In short, I appear to like trailers that use music stupendously well. Nano (1996), by Ed Regis, tells the story of nanotechnology up to 1995, and serves as a cautionary tale for others trying to promote the development of a novel science from outside the establishment. Recommended. The Visioneers (2012), by W. Patrick McCray, tells the story of both Gerard O’Neill — who advocated space colonization in the 1970s — and Eric Drexler, pioneer of nanotechnology. It’s less detailed than Nano, but also recommended. Soldiers of Reason (2009), by Alex Abella, is a history of RAND Corporation. Most of it is pretty interesting, especially if you happen to run a nonprofit research institute, though I disagree with the author about the purpose and value of rational choice theory. David and Goliath (2013), by Malcolm Gladwell, includes some great stories as usual but is also Gladwell’s most annoying, disingenuous book yet. Think Like a Freak (2014), by Levitt & Dubner, also includes some great stories, and is less annoying than David and Goliath, but is basically a repackaging of posts from their blog. A Troublesome Inheritance (2014), by Nicholas Wade, is about race, genes, and IQ, a touchy subject! The Knowledge (2014), by Lewis Dartnell, is about what we’d need to know, and what knowledge we’d need to preserve, to reboot human civilization as quickly as possible after some kind of apocalypse. I wish there was more available on this subject. Recommended. MIRI’s first technical report on the value-loading problem in FAI in a long time. GiveWell lays out their reasoning on why some U.S. policy areas look more promising for philanthropic intervention than others. More evidence that disagreement is less resolvable when people are thinking about their positions in far mode. On the unusual effectiveness of logic in computer science. Mandiant’s 2014 cybsecurity trends report. Interviews with Kasper Stoy, Harry Buhrman, Michael Fisher, Benjamin Pierce, Sandor Veres, Johann Schumann, Lennart Beringer, Aaron Tomb, and Milind Tambe.